Hey all, just a quick note to let you know about a Live Chat and Podcast I’ll be doing with the guys over at TGT Webcomics this Sunday at 9pm EST/6pm PST. The chat will be done through Talk Shoe, so anyone who would like to be able to participate in the call can do so, and there will also be a simultaneous chat going on that you can join in and lob questions through. Hit this link Sunday night to listen in and/or participate. We’ll be talking MONSTERPLEX, of course, but also SuperFogeys. And, given what’s gone down this week over at the SuperFogeys, we should have lots to talk about. That should give you enough to chew on for another week, don’t you think? Chapter 7 was a bit of a long con, but my hope is that, in the end, it was worth it. Good time to read it from the beginning, don’t you think? A lot of you protested the idea that Tom was dead…and you were right, he never was. I didn’t intend for it to be a mystery of Herman-like proportions, and my sense is that for most of you it was not. That’s good. This is a schizophrenic chapter in a lot of ways. 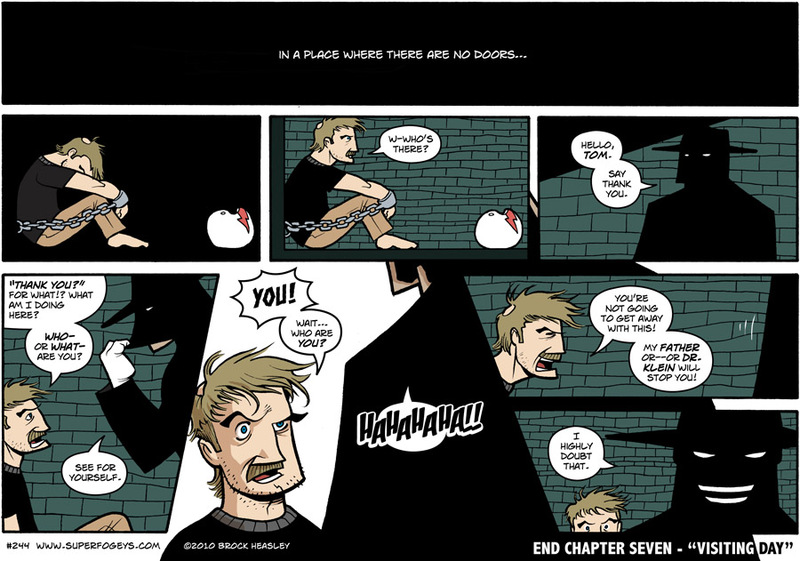 The first half was very light, but from the moment Tom showed up we headed into a very dark place (not Chapter 5 dark, mind you, but you get my meaning). I know I sometimes get complaints about the wild tonal shifts in SuperFogeys, but that’s my worldview. Cancer with a pie in the face. If you get my meaning. “‘Visiting Day’ is the day when all the friends and family of the Fogeys are invited to come to Valhalla to see their loved (or not-so-loved) ones. You’ll get to meet some of the near-and-dears of nearly all of the Fogeys (nearly?) and the identity of some of them will surprise you. Not too bad, right? I think what I’m referring to when mentioning jumping the shark was the stuff with Tangerine reading the Bible. Don’t know that I actually did lose anybody. Guess they’re not around to tell me if I did, right? What did you think of Chapter 7? Anybody have a favorite chapter of the SuperFogeys? SPOILER! CHAPTER 8, “THE CAPTAIN AND THE SPY” TEASED! Chapter 8 will be the shortest chapter of the SuperFogeys by far, clocking in at around 7 strips (some double-sized, I’m sure). As the title suggests, I’m gonna be focusing on Captain Spectacular and Spy Gal. Expect a slightly different look for Cap. Also, Spy Gal will give him the finger. Don’t worry, I won’t censor it. A new character, Barry, will be mentioned but not shown. He’s an important figure in Spy Gal’s life. That’s…about all I can tease. It’s a short chapter, like I said. But I don’t think enough attention has been paid to Captain Spectacular and Spy Gal’s relationship. Time to correct that. Hopefully you all are as interested in that as I am. MONSTERPLEX – ONE WEEK LEFT TO VOTE! 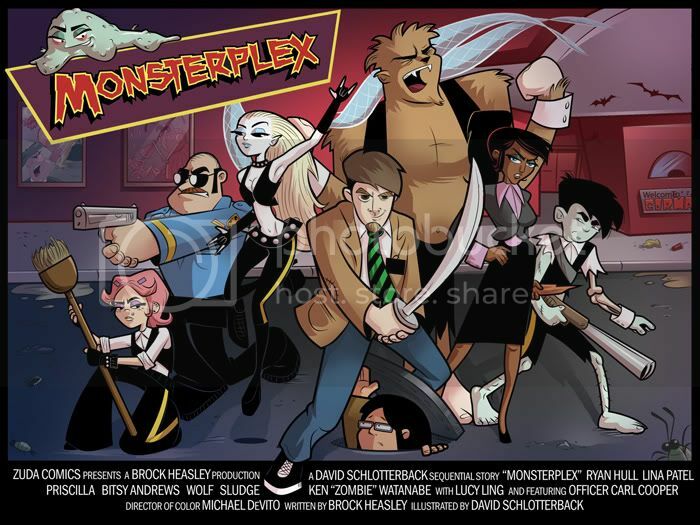 I know you’re probably all sick of hearing about Monsterplex. Not as sick as I am, believe me. This campaigning is tough stuff. Look, there’s only one week left and I must ask you to please head over to MONSTERPLEX ON ZUDA to check it out. Corny as it sounds, winning this competition would be the fulfillment of a dream. I know a lot of you have, but I also know that hundreds and hundreds of you have not registered, voted, favorited, star rated and commented yet. It only takes a minute and I’d be ever so grateful. Thank you. On Tuesday, two of Captain Spectacular’s exes meet for the first time. Then, on Thursday, Chapter 8, “The Captain and the Spy” begins! SuperFogeys - 529 – Why Did Jerry Do It?